The Learning Community of the on-demand course is taking shape. Practice a clinical neurological exam on a virtual patient. Clinical neurological exam on virtual stroke patient. Practice a clinical neurological exam on a virtual stroke patient at http://stroke.simcenter.duke.edu and share your experiences. What does it take to make a MOOC? What does it take to make a MOOC? 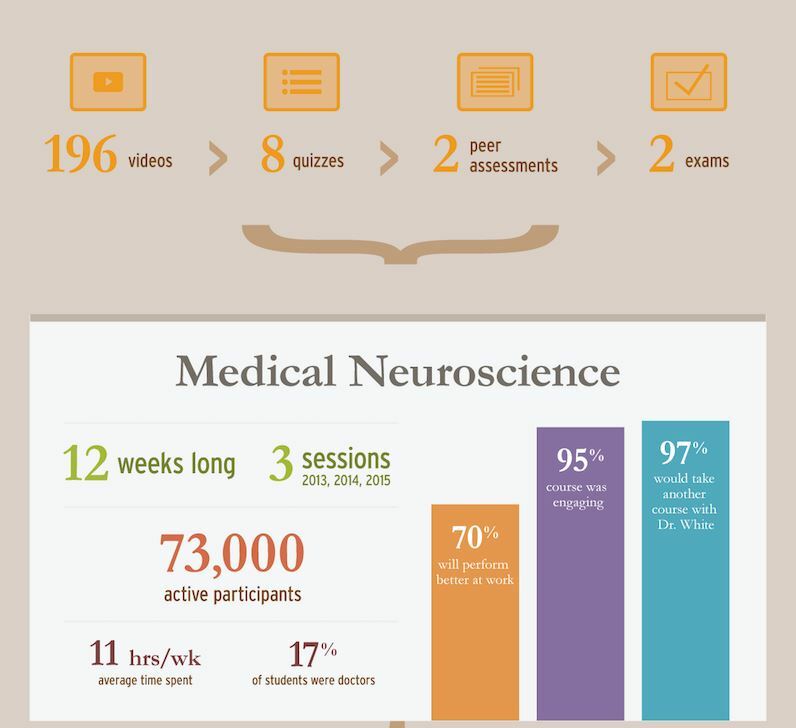 Duke’s Center for Instructional Technology created a infographic that tells the story of one MOOC, Medical Neuroscience, taught by Duke professor Leonard White. The infographic illustrates just how much effort goes into one online course (196 videos, for example) and the many far-reaching impacts that come out of it. Duke University was an early Coursera partner and has produced 31 MOOCs (and counting) for a total of over 2 million enrollments since 2013. 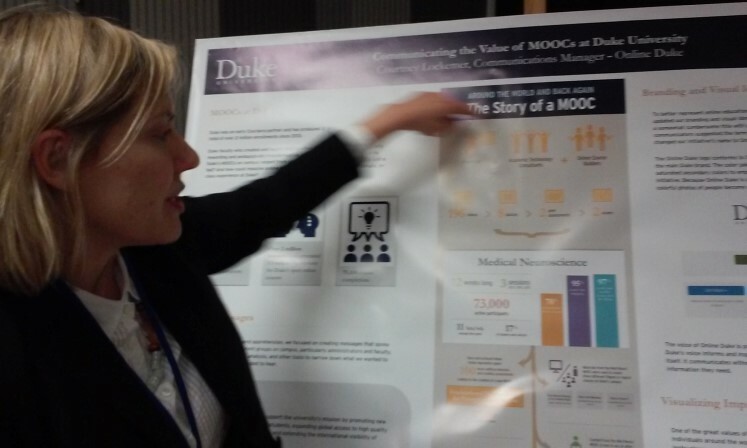 Duke faculty who created and taught MOOCs often found the experiences personally rewarding and pedagogically transformative. 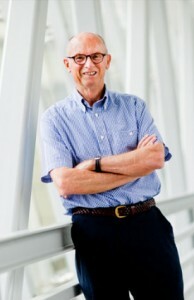 Prof. White recently participated in a unique interdisciplinary conference on humor at the University of North Carolina Chapel Hill (see website for complete description of the conference: http://humor.web.unc.edu/). His talk and demonstration was entitled, “A Neurobiological Consideration of Humor”. 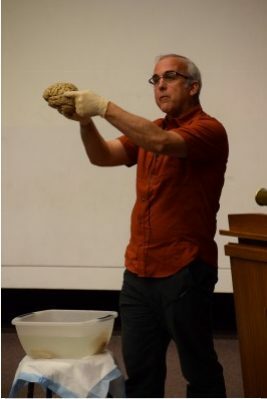 In keeping with his Medical Neuroscience style, he brought human brain specimens to demonstrate to the diverse audience how the brain processes humor. The audience included, social scientists, psychologists, philosophers, humanists, feminists, humorists, television “sit-com” writers and producers, professional comedians, and students from a variety of disciplines. 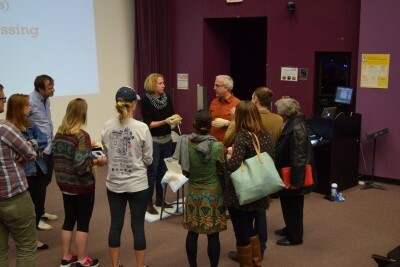 Several attendees gathered around the brains at the conclusion of the presentation for a closer look, to ask questions, and to hold a brain. 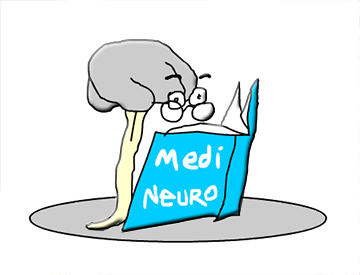 The first session of Medical Neuroscience was in 2013. The course is designed for people that are enrolled in a health professions curriculum or are preparing to do so. The intellectual challenge and content level of this course is comparable to what first-year students in the graduate-level health professions would experience and the course is expected to require 16-20 hours per week of effort. During all the sessions there good, lively and instructive discussions on the Discussion Forum. On the Coursera Blog there is a nice Infographic “How the World Learns“, a global analysis of online learning. 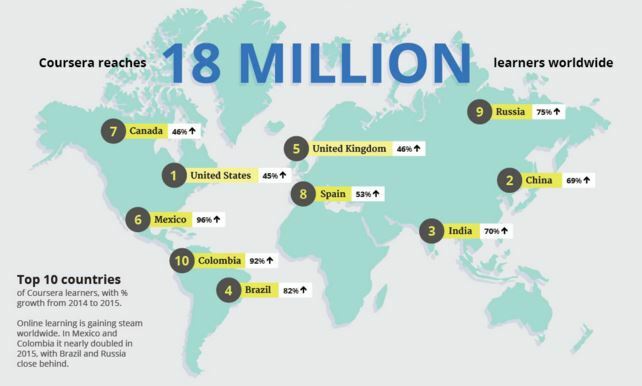 The Infographic gives insight in the Top 10 countries for Coursera’s online learning. The Final Google Hangout of the last session based course of Medical Neuroscience (the course will continue in the on-demand format). With Prof. White and Nicholas Janes on Thursday, March 17, 2016. 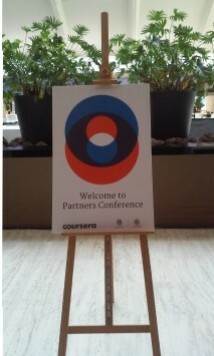 In 2016 an energizing, inspiring Coursera Partner Conference was held in the Hague. Prof. Len White arranged for me to attend the course, Ellen Vos-Wisse.